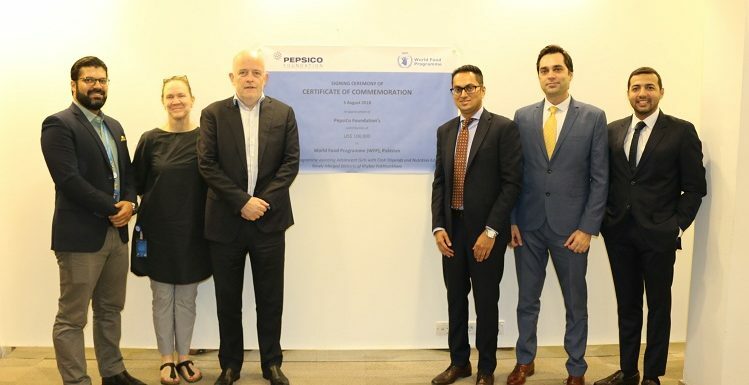 PepsiCo Foundation announces $100,000 grant to World Food Programme for school-going girls in KPK. Ahead of the start ofthe academic school year,the PepsiCo Foundation has announced a USD 100,000 grant to the United Nations World Food Programme (WFP; the world’s largest humanitarian agency fighting hunger worldwide).This contribution to the WFP will help deliver 400,000 nourishing meals to underserved adolescent female students in the newly-merged districts of Khyber Pakhtunkhwa province. The grant was awarded as a result of Ready, Step, Move…Give!, a step-challenge program created by Healthy Living, PepsiCo’s employee well-being program, and the PepsiCo Foundation, to encourage employees to get moving and focus on their well-being,while giving back to help feed children in need. The newly-merged districts of Khyber Pakhtunkhwa province consist of areas where there are low levels of female literacy; most girls of high school age are not in school. This collaboration between the PepsiCo Foundation and WFP will encourage girls to continue their study to secondary level, and help keep them in school. Ready, Step, Move…Give! is part of PepsiCo’s Performance with Purpose initiative, a set of goals focused on delivering sustainable long-term growth while leaving a positive imprint on society and the environment. By 2025, PepsiCo has committed to provide access to at least 3 billion servings of nutritious foods and beverages, to underserved consumers and communities, through a variety of channels, and through programs supported by the PepsiCo Foundation. PepsiCo is making steady progress on this goal, and as of 2017, over half a billion servings have been made available.